Hazelnut shortbread squares filled with Nutella. I had a package of Italian hazelnuts in the freezer that needed to be baked into something good. So what do you think? Did I do them justice? I think so. The dough for these cookies can be mixed in advance, rolled into logs, wrapped in plastic wrap and foil, and then frozen. When you are ready to bake the cookies, all you need to do is thaw, slice, and bake. Perfect for holiday baking, right? To portion the Nutella filling, I used a small scoop, and was really happy about how evenly the filling spread between the two cookies. You could also use a pastry bag to fill the cookies. The cookies are "sandy" without being too crumbly. I think they have the perfect shortbread texture. 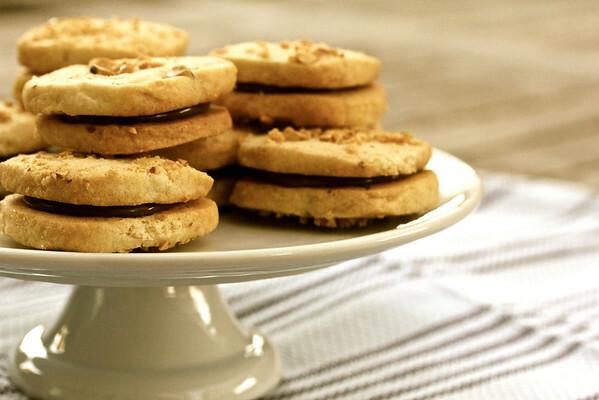 They have a wonderful sweet-salty taste and they hold up really well to the Nutella filling. I will definitely be making these again and again. If you can't find skinned hazelnuts, visit this post for a "how to" on peeling them. To toast the hazelnuts, preheat your oven to 325 degrees F and bake the nuts in a single layer for about 15 minutes. Cool before grinding/chopping. A mini food processor is great for grinding the hazelnuts. King Arthur Flour also has ground toasted hazelnuts. Slightly adapted from Slice & Bake Cookies: Fast Recipes from your Refrigerator or Freezer. 3 T chopped hazelnuts that have already been peeled and toasted. Pulse the hazelnuts and the cornstarch in a food processor until finely ground. Add the butter, sugar, and vanilla in the bowl of a stand mixer and beat on medium for a minute. With the speed on low, add the hazelnut/cornstarch mixture and beat until mixed. Add the flour mixture and beat for about a minute. Divide the dough into two pieces and form them into square logs. The sides of the squares should be about 1 1/2 inch wide. Wrap with plastic wrap and refrigerate for at least 3 hours and up to 24 hours. You can also wrap it in foil freeze it at this point. Place a rack in the middle of the oven and preheat it to 375 degrees F.
Spread the chopped hazelnuts out on a plate or cutting board. Cut the dough into 1/4 inch slices and gently press them into the chopped hazelnuts. Place them, nuts side up, about one inch apart, on the baking sheets. Bake for about 13 minutes, until slightly golden on the edges. Cool on racks in the pans for 10 minutes. Move the cookies from the pans to racks and cool completely. 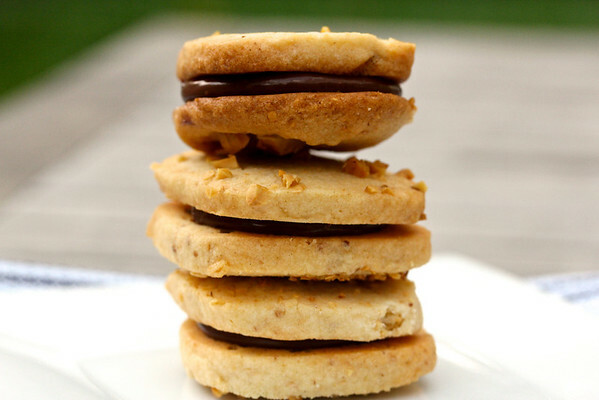 On the flat side of one cookie, place about a teaspoon of Nutella and top with another cookie to form a sandwich. Gently press the cookies together to spread the filling. Store at room temperature in a sealed container for up to three days. 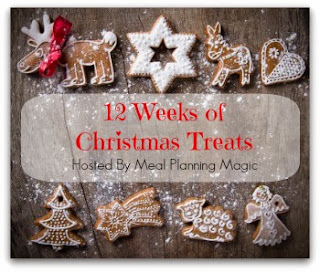 This is the third week of Twelve Weeks of Christmas Treats created by Brenda of Meal Planning Magic. 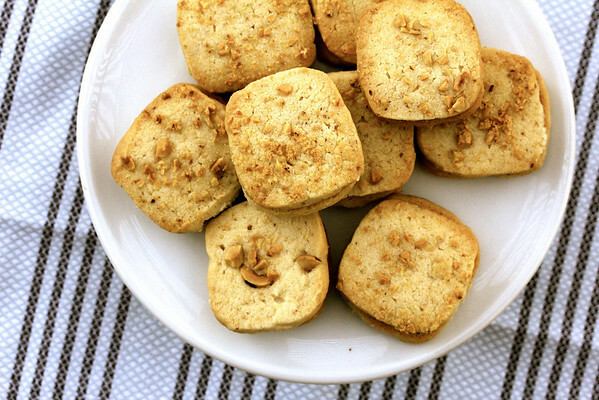 Each week we post recipes for treats that would be perfect for a holiday party table. We also have a Pinterest board that you can follow to get great ideas for your holiday dessert table. (If you are a blogger and would like to bake along, here is a >link< with information about participating). Karen, these cookies sound fabulous! Anything with Nutella is my fave! Thanks for sharing on Saturday Night Fever! Pinning this now! See you again this week!